Originally, Mokume Gane was a metal-working technique developed in 17-th century Japan, producing a metal surface with distinctive layered patterns. Mokume gane translates as wood eye metal. 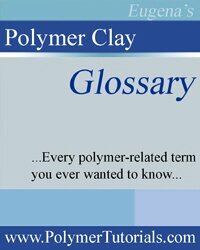 Adopted for polymer clay, this technique involves stacking layers of clay, distorting them, and then taking slices off the hills and valleys to reveal the different layers. A variation of this technique requires a Ripple Blade. Also: Metal Leaf may be used to further emphasize layers of polymer clay. 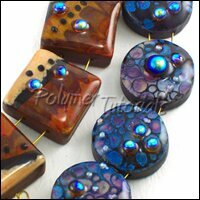 Please refer to my Faux Lampwork tutorial to learn one of the variations of mokume gane for polymer clay.